For friends and family and even clients and employees, gourmet gift baskets are full of the right stuff this holiday season. At Fancifull Gift Baskets, owner Terry August says gourmet food is the most sought after item because it has a more indulgent quality to it. "Most gift-givers want to surprise someone with products that are unusual�and delicious of course," August says. Customized gourmet gift baskets also allow the gift giver to show off their food savvy. "Sending a basket of Belgian dark chocolate or Spanish wine is a great way to share a new food find," August says. One great food find is Dancing Deer's Holiday Chewy Cookie Sampler, which includes the award-winning Molasses Clove chewy cookie. The soft, crackled-top cookies look like they just came out of the oven. Chris Gagnon, VP of business and product development, says Dancing Deer's cookies, cakes and brownies are comfort foods with a gourmet twist. Flavors like chocolate tangerine and Meyer lemon raspberry ricotta make these tasty treats extra special. 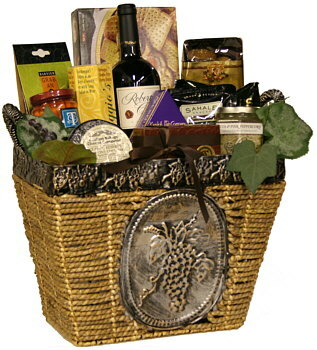 Gourmet gift baskets also make great holiday gifts because they usually consist of several pieces and can be shared. Christophe Van Riet, owner of Nirvana Chocolates, describes his company as a virtual Belgian chocolate boutique. Gift-givers can pick from 45 different varieties of chocolates, marzipan and pate de fruits (fruit jellies), making each gift unique. For corporate buyers logo-engraved ribbons, labels and sleeves can also be added to make gifts more personalized. Van Riet says the most popular variety of gourmet chocolate right now is dark chocolate. The newly discovered anti-oxidant health benefits of dark chocolate, the access to high-quality cacoa and America�s evolving taste has increased the popularity of the bittersweet varieties. Single variety dark chocolate, with its rich flavor and aromatic notes is a great holiday gift. Dagoba Organic Chocolate is known for producing amazingly distinct high-quality dark chocolate bars in single varieties or blended varities with social responsibility. Dagoba offers chocolates that are both organic and fair-trade, including bars, drinking chocolates, baking items and gifts. Dagoba sources from Costa Rica, Peru, Madagascar, Ecuador and the Dominican Republic. Another trend in gift baskets this year is exquisite packaging. A hand-painted tin, a Shaker-style box or bamboo-woven basket is very nice indeed, but Jinil Au Chocolat goes one step further and uses fine lead crystal for its holiday gift baskets. Mark Kaplan, Jinil Au Chocolat's president, says chocolate, fruit or candy usually doesn't last long, but a crystal vase or dish can be cherished for years. Jinil also offers a plethora of unique shaped chocolates to help create a lasting impression. A basket of sweets is sure to bring cheer to anyone, but a gourmet gift basket with decadent home-style cookies or imported chocolates guarantees they will savor the season.